Monday, Apr. 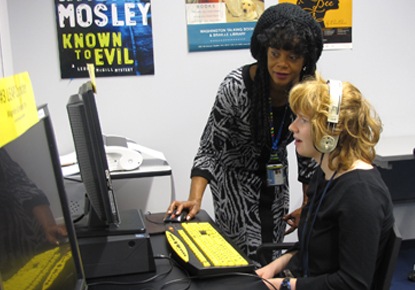 22, 2019, 10 a.m. – 5 p.m.
Come to the LEAP Drop-In Lab session for up to an hour of free, one-on-one help in the use of the Library's assistive technology for disabled and special needs patrons. LEAP staff members are available to answer questions and assist in the use of the Library's JAWS speech and ZoomText magnification software. Staff is also able to assist patrons in the use of the assistive technology to download eBooks, setup free email accounts, or request books and DVDs, or help with other adaptive equipment.